Tel Aviv is a new cookery book written by Haya Molcho and her four sons, as they visit the city of her birth to meet local chefs and storytellers. 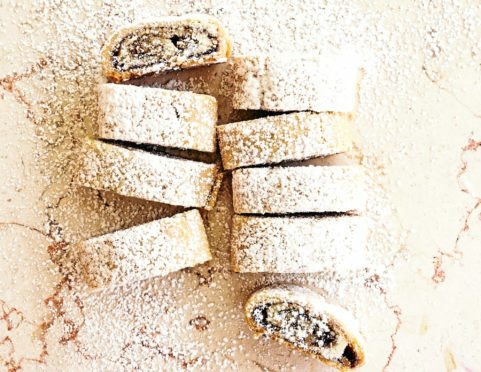 Ma’amoul are famous Middle Eastern, melt-in-the-mouth cookies filled with dates and nuts. The book is out now from Murdoch Books. For the dough, combine dry ingredients with the flat beater attachment of your mixer. Dice the butter, add to the bowl and continue beating until it has a sandy consistency. Add the egg and keep beating to make a smooth dough. Knead the dough for a few minutes by hand, wrap in plastic and chill in the fridge for at least 1 hour. On a floured work surface, roll out the dough to a 2mm thickness and cut into 2 equal rectangles. Lay the dough pieces on baking paper and chill for 30 more minutes. Meanwhile, for the filling, coarsely chop all the ingredients except the date paste in a food processor. Gently warm date paste in a small saucepan with 3 tbspn water until it melts. Preheat the oven to 190C (375F). Spread half the date paste thinly on each of the dough sheets and sprinkle each with half the nut-spice mixture. Roll up the dough with the filling from the long side and score the top diagonally at 1cm intervals. Bake the dough rolls in the oven until light brown, about 20 minutes. Remove and leave to cool a little. Cut into 1cm slices at the incisions and dust with icing sugar.